COY HERMAN “TOOTS” MANSFIELD - grew up on his family ranch on the site of Mansfield Park. “I remember his mother calling him ‘Coy Herman’ and that was when she’d be calling him home from the rodeo arena,” says niece, Barbara Mazurek. “He got his Christian name from the initials of his father.” Hi father, C.H. Mansfield, died when Toots was young, but uncles Dudley and Ed and his brother, Rhea, were early influences as he honed the techniques that made him a champion. 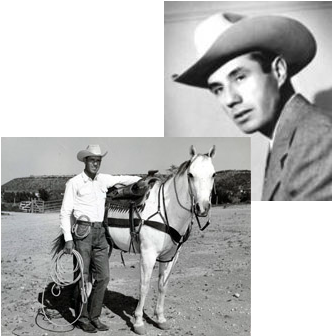 He credited Juan and Tony Salinas of Encinal, Texas with teaching him the subtleties of calf roping that took him to the seven world championships he earned between 1939 and 1950.